We’re trying to avoid cursing at home as much as possible and so far our children did not pick up any curse words. But for some time now our three-year old son has been using the word “poop” quite often. He finds it very amusing. I think it all started when our kids were practicing joking and this word was said in an innocuous, funny context. He picked it up and it stuck. Now he’s using it often at numerous occasions. Sometimes to get attention. Sometimes to make people laugh. And sometimes when he’s angry. Especially when he has to do something he does not want to or when he’s punished. Then he repeats or exclaims it multiple times, or says “you are a poop!”. Because he hasn’t been exposed to cursing before, I think he invented cursing on his own. Cursing is apparently natural and as some studies indicate, brings relief in some situations, e.g. reduces pain. Interestingly we’ve never had such problem with our daughter. This is one of the many examples we’ve noticed of the differences between males and females. User interface is the most important feature of all devices (and software). It exposes all device functions to the user. Without user interface, all features of the device would be useless. Apparently companies who have been around for tens or even hundreds of years are still making mistakes in user interface design. Here are two examples. 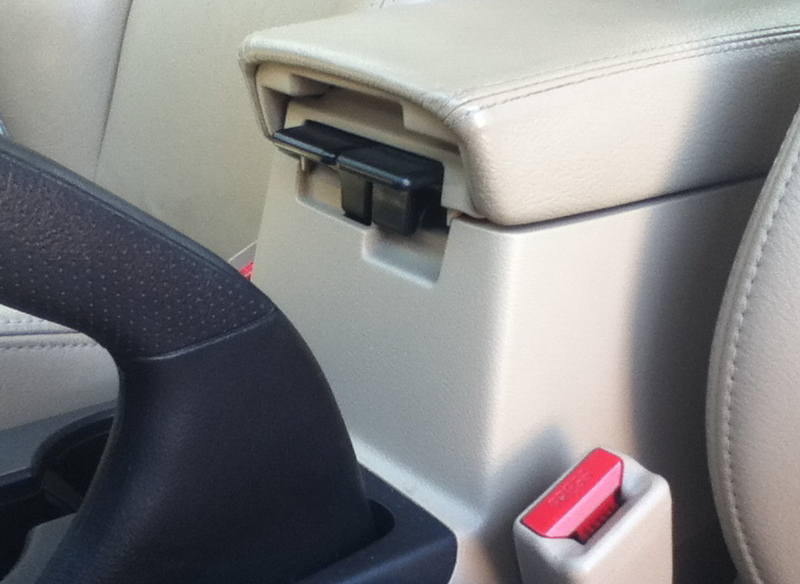 The compartment has two levels. Hence there are two levers under the armrest. One of them opens the top, flat compartment, the other one opens the bottom, big compartment. Unfortunately I am not able to memorize which lever opens which compartment. I used to keep a box of kleenex/tissue in the bottom compartment. Whenever I wanted to take one tissue out, I had to guess which lever to pull to open the right compartment. And somehow I always guessed wrong. Very annoying, esp. during driving. Cars are known for very well-thought user interfaces, which don’t get in the way. But in this case – they blew it. This is a standard piece of equipment and a standard user interface solution. Well – nothing less annoying. The flaw here is almost the same as in the case of the dual compartment above. 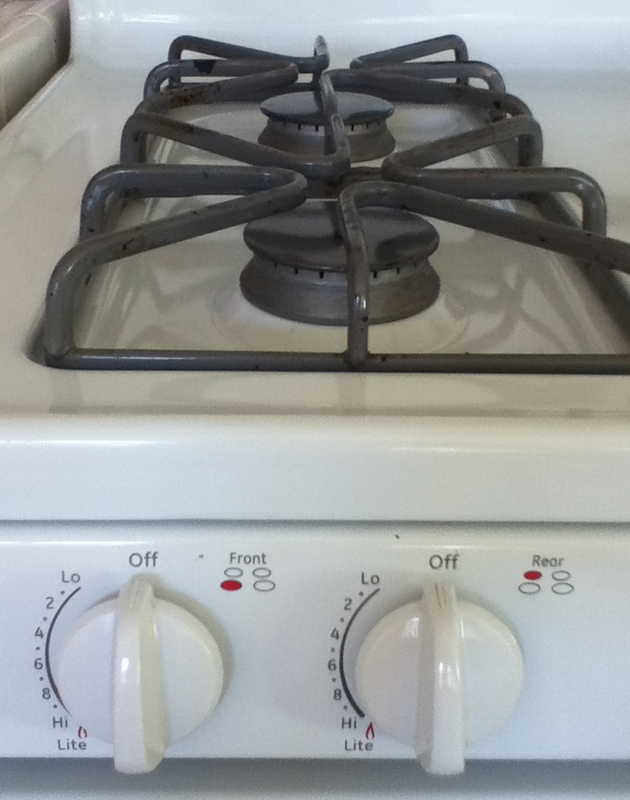 There are two knobs, one for each burner. Unfortunately the burners are aligned vertically, while the knobs are aligned horizontally, giving you no clue (without taking a closer look) which knob is for which burner. In order to tell which knob is for which burner, I have to bend. Often I don’t want to bend, I just want to turn the burner on. When I don’t bend and look at the pictures which decipher the knob-to-burner assignment, I always choose the wrong knob and turn the wrong burner on. Like in the dual compartment case, it is not possible to memorize which knob is for which burner. Maybe because the pair of knobs on the other side for the two remaining burners is swapped. Well, at least they left a visual clue for the people who are not too lazy and actually bend or take a step back to determine which knob to turn. Please note, that when you’re close to the stove and e.g. putting a kettle on the back burner, you don’t see the icons over the knobs and you either have to bend down or back or you have to take a step back. As innocuous as they may seem, these can be quite annoying. How many broken UI designs can you spot around you? A few years ago California introduced a law which bans texting or talking over the phone while driving. The problem is, that this law is unenforceable. Every day I see many people clicking on their smartphones when waiting on the red light and often even when driving. Not only they risk their and other drivers’ lives, but they also show disrespect to other people. It always makes me angry when I am waiting on the red light behind somebody, the red light turns in to green and I am waiting multiple seconds before the clicker in front of me notices the green light. Often I have to honk to draw that person’s attention, the person starts driving lazily and keeps clicking. The problem is so widespread that the police has no way of catching the clickers and enforcing the law. Maybe in 10 years we will have technology which blocks the phone when it is inside a car, maybe phones will automatically detect that they are inside the car and will lock their UI. Also self-driving cars will probably also take over when they detect that the driver is not paying attention or is drunk. Until then, the anti-texting law should probably be repealed, for it makes no sense. What do you think? Do clickers annoy you when they are blocking your driving, do they offend you, or are you OK waiting for someone whose mind is somewhere else and not on the road? The wheel is often mentioned as the cornerstone invention of our civilization. I’m not arguing it’s not true, but I consider writing as one of the most important inventions. Information management such as precise collection and transfer is crucial for any civilization to make progress. Written information can be exchanged without errors. This includes everyday communication, trade, history, law. Writing also enabled progress in engineering and science. Humans are not a good medium of information, because their memory is unreliable. They forget things, or misinterpret them. Religion and knowledge used to be passed from shaman to shaman using spoken language, whatever they forgot, had to be rediscovered again. But after the invention of writing humans started organizing into bigger groups and started creating new, magnificent technologies. Advanced religion, which was also an important piece of the evolution of the civilization, was also not possible without writing. Every tribe used to have their own set of stories and of course they used to clash over whose stories are right. Once religious manuscripts were created, people started uniting over religion, what helped the development of nations. Next time you’re writing something, realize that you’re using one of the most important inventions of our civilization. I don’t have broadcast TV reception at home. In fact I only listen to the radio in my car and only on the way to or back from work. That’s like maybe 20 minutes a day tops, on a good day. The most common are commercials. When I hear a commercial I just switch to another station. The next station often also has a commercial, so I keep going until I find one which doesn’t, or I turn the radio off. The next common thing is music I hate. Typically these are the so-called “hits”, i.e. music which someone in a record label decided to promote. I have no idea how people can listen to most of this kind of stuff, it’s usually loud BOOM, BOOM and a woman screaming out her lungs or some tune which is so annoying that I switch the station before I hear the chorus. There are specialty stations which only play one kind of music. They are a nice change on the first few listens, they usually play more music than commercials and they don’t play the usual kind of trash than most stations do. However these stations get annoying after a few weeks, because they are playing the same things over and over again. How many times in a row can you listen to the same old song? Even though I listen to any kind of station at most 20 minutes a day, so that’s even much less per station, I can tell that they are repeating their stuff, so their selection of music must be really low! Take the music collection on your favorite pocket device, how often will you hear songs repeat if you listen only to 5 songs a day? Sometimes its fun to listen to foreign language stations, for example it’s easy to tune to some Mexican station in the US. The Mexican songs are fun from time to time but they are also all written to the same kind of melody and they are also all about a broken corazon – I challenge you to find a song in Spanish which does not have the word corazon in it. Back to TV. I do watch broadcast TV a few hours a year, for example when I’m in a hotel. Every time I watch TV it reminds me why I don’t have it at home – there is nothing on it. You can have hundreds of channels, and none of them has anything interesting. Sure you can laugh at some sitcom once in a while, but that’s it. OK, maybe you can find some interesting series from time to time – but then it’s interrupted every 5 minutes with very long commercials. So out of a 40 minute show they can easily make a one hour show. If you really like some show, then you need to remember to be at home ready at exactly the time they have it, otherwise you will not be able to watch the whole thing. If you have extra money to throw away, you can get a DVR, but the commercials remain. The Internet to the rescue! Fortunately there are streaming services now, so you can watch whatever you want, whenever you want/can and without commercials. And it’s inexpensive. I don’t know why people still watch broadcast TV at home. Internet radio is nice, but it’s not available in my car, plus it’s also been crippled with commercials in the recent years. There are paid options, but I don’t spend enough time in my car to want to pay for that. How long before broadcast TV and radio share the fate of dinosaurs?